In 1836, the French King Louis-Philippe, enthusiastic for Southern Hemisphere exploration, supported J. Dumont d'Urville's plan for a circumnavigation focusing on the South Seas. D'Urville (1790-1842) had already distinguished himself on two Pacific expeditions and was eager to rival the achievements of James Cook. Between 1837 and 1840, the ships Astrolabe and Zelee explored the waters of the Antarctic area and Oceania in extremely harsh conditions: almost forty crew members died or deserted. However, d'Urville discovered a new portion of the Antarctic coast, shed light on the ethnography of several Pacific islands and brought back multitudes of botanical specimens. His impressive contributions to the fields of geography, natural history and ethnography were gathered in this ten-volume work, published between 1841 and 1846. 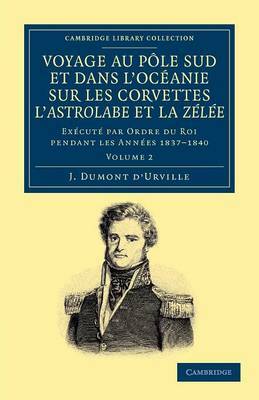 Volume 2, published in 1842, traces d'Urville's first heroic but failed attempt at locating the south magnetic pole in 1838, and his return to Chile.